Camp Patton: ... in like a lion. I'm a little nervous for you readers (or maybe there's just one or even none because Saturdays aren't for blog reading) because Simon has been out of town on the interview trail for the past infinite number of hours and my social interaction with adults has been limited to the teenage cashier at the pharmacy donning a hoodie that read, "I'm a teenage anarchist" telling me that I have my hands full. So ... I'll have to be careful not to blogvom allllll over your laps but ... you've been warned. Anyway, Simon gets back late tonight and I'm wondering if it would be too much to present him with an outline of all the things I'd like to discuss? We're in the middle of a very very serious situation called, "Sebastian thinks he is potty trained" (he's not) and it has involved a lot (LOT) of bodily fluid clean up and a seemingly irreparable toilet clogged with an entire roll of toilet paper. I'm about to just duct tape a diaper on him and stunt his personal hygiene growth because the kid ... he wants me dead. So I'm thinking we should dedicate at least 90 minutes of prattle to that, right? And then we can move onto the noise that comes from Julia's room during her nap time that sounds like she is strangling ostriches .... but she insists she's just, "banging out" with her toys. Anyway ... I'm sure he's excited to come home. He has seven interviews over the course of the next forty days which doesn't sound too insane but factor in his regular work schedule and some of the distances he's driving to said interviews and all of his call weekends ... fine, still not insane but not a boring spring. I'll be 38 weeks along when he trots off to his last interview ... Julia was born at 38 weeks, Bash was born two days shy of his due date, and Theo was born at 37 weeks, so I'm thinking this baby might be our big bad 42 weeker ... we'll see. We shall see. And that's going really well, obviously. if you want to check them out. Or don't. No pressure. ... and it wasn't nearly as awful as I'd anticipated. The line was only 6 people deep as opposed to the usual dozen or more and Julia brought her medical bag inside in case of emergency so I was able to breathe pretty dang easy the entire time. I then tempted fate and hit up Target with the kids .... tweeted my frustration with single people that utilize the family restrooms and realized I'd hit a true low. But I did find toddler fedoras in the dollar bin so .... in the end? Win. And now I've promised Julia that we can make banana bread for Simon's homecoming while the boys sleep so ... a baking we will go. She's suggested we, "leave out the banana and bread parts and just make cake" so ... a cake baking we might go. Happy rest of the weekend to you and yours. Banana bread without the banana and bread parts... ha ha. Doesn't sound like there would be much left! By the way, I LOVE when you post on weekends! I totally read blogs on the weekends and there is usually a weekend blog famine when no one is posting, so post away! Julia is my kind of gal! And I am still trying to teach myself how to shoot in Manual. I've spent lots of money of tutorials, books, etc. I learn something about a setting, get very excited about my new skills and then boom...when it's time to actually take a picture of a person or an event, I panic and forget everything I "learned" and resort to Manual. Gah. Strangling ostriches...ROTFL. I don't even think I know what an ostrich sounds like. I need you to please put more clothes up on your shopping IG feed. Our tax refund comes in on Monday, so of course I'm already deciding what I'm going to order the minute it comes in (Monday at like 5am), but I. hate. maternity. clothes. I realize that's neither here nor there, but...my husband's gone for the late shift all this weekend, so I'm explaining all this to you O_o. I really like White Plum, though. Did you see their new linen pants? I just need those in shorts, because Texas in the summer + my pregnant self...a big puddle of perspiration. Potty training boys is fun right? We have deemed the downstairs guest bathroom as a 'potty training only zone' because I dare someone to not step in bodily fluids in there. And no matter how many times I trail behind them with gloves and lysol wipes they just.dont.get.it. Thinking about just digging a hole out back and letting them be one with nature....kumbaya style! I really think you should do a blog post on how you find the wonderful cloths you find online... because I try and end up with something my 90 year grandmother would wear. I know it is a lot of luck but there has to be some technique to it, because you and your kids always look great. oh - but thank you!! I think it helps that the older two can share the bulk of their clothes .... gives them double the wardrobes .... sort of!!!! Manual takes a bit of getting used to but I promise you will love the photos to come. My biggest hurdle at the moment is getting the "speed" right. Miss Courtney's got moves like Jagger and it's very hard to get photos of her unless she is still, which is next to never. It takes 75 blurry shots for one semi-decent shot. So I am still learning. Happy bread/cake baking! I hope Simon is home soon! From what I understand the additional stress of potty training boys evens out around puberty with the additional stress that girls bring then. Having only raised boys, I can't swear to it. I think Dr. Patton should set up a practice in the North Georgia mountains. You guys could live here on Patton Lake which would make the whole Camp Patton thing a double. The Catholic church here is so pretty that my niece (the daughter of a Baptist preacher) says that it's the prettiest church in the world and she would go there if she didn't go to First Baptist. The nearest Costco is about an hour away, though, so that's a drawback. We do most of our shopping online. When does he finish residency? And back to the boys and potty training - my boys were always forbidden to ever EVER use my toilet and I have only withdrawn that restriction in the past six months. Mothers who raise little boys should never have to share a potty with them. Wishing Simon the best of luck with the interviews... I know that particular pain rather well. Target here in Australia is a similar treasure trove of bargains at the end of each season. Braving the Co with my little man this afternoon. What is not to like about riding in a large trolley and being able to ponder the strangely hypnotic lighting fixtures? waaaait --- Australia has Costco?! and I think Americans should start calling carts "trolleys" .... it just sounds so much better!! Have a great weekend as well!! Hi Grace, I've never commented before because usually by the time I hit up your blog the comments are 40 or 50 in and I figure why bother, she isn't going to see this. I have three teens and a seven year old so I'm way beyond the baby years and toddlerhood, but I still love reading your blog. You are quite amusing and your kids are adorable and reading here reminds me (truly, I mean this, I'm not being a sarcastic wise guy) how much fun it can be having little kids running around. My teens are a whole different level of interesting, but they're fun as well. Actually they're kind of like toddlers only they can drive. I'm glad you posted on a Saturday. Blogland is alway so boring on the weekends and you gave me something to laugh at here. Speaking of toilet clogs...we recently had to buy an industrial toilet auger to remove a clog that all the kids claim they didn't do and the fun part was that didn't even work. Hubby was at the point of having to remove the entire toilet to get to the clog. Thankfully the toilet gods had mercy on us and after 3-4 days of doing nothing the clog was gone. Procrastination wins again! I read blogs on Saturdays! My husband works Saturdays so it is the same as Monday thru Friday for the rest of the world. You are amazing to brave the post office. I just donate everything because I can't deal with it and 2-3 kids. And potty training boys . . I can't imagine. My neighbors' little boy recently flushed his toy car (I think like matchbox size) down the toilet, causing it to overflow in the night and wreak havoc on the floors and walls below. And when I heard the news, I was making notes to warn my (sometime in the future) kids about the dangers of this activity and my husband's like, "they'll just flush something else." So comforting. I do love banana bread, but who can argue with leaving those parts out and going for the cake? I read blogs while I nurse my baby to sleep, so yep, gotta do that every day! I've never commented here before, but I've been reading since it was a wee newborn blog. Creeper right here. Anyways I just had to tell you something weird and sanity saving! I sell some of my kids' old clothes sometimes and would have to go stand in line at the post office, which was a nightmare with my three, 3 and under. Bravo for surviving a line of 6 people!! Long story shorter, I found out you can buy your postage on the USPS website, print it, slap it on your package, then toss it on the counter at the post office and run. No waiting in line. Good luck with the interviews, that sounds like a super full month! Good luck with all the interviews, for both of you!!! 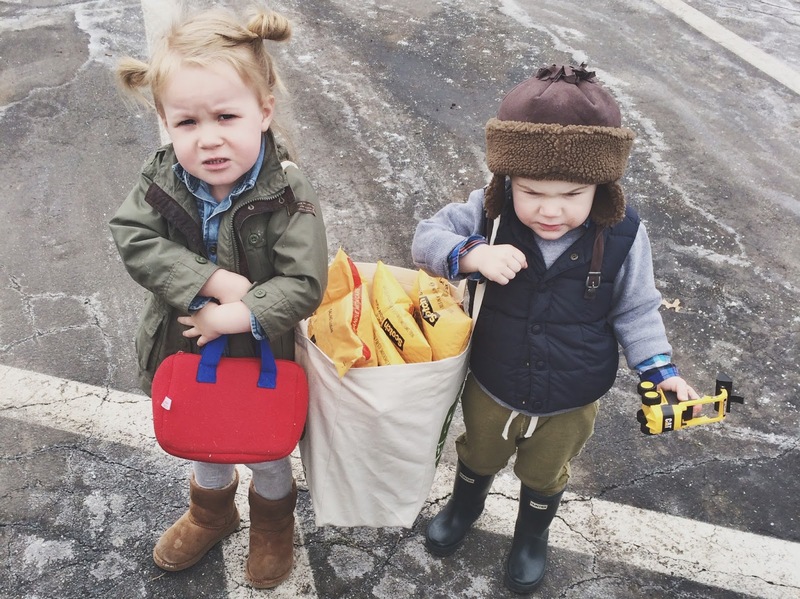 Also, your kids look so cute carrying in the packages to the post office! I may (or may not) have been known to blast my husband with a list of 47 things we need to discuss as soon as he walks in the door. They are all of dire importance and need to be discussed in order to be crossed off my list. This solidifies it: your children are all better dressed than I. Just in case you decide to cleanse yourself of a few toys - we take toy donations at my work (Easter Seals Midwest, in STL), where we use them in therapy for children with autism. I'd be happy to pick them up or meet you somewhere if you ever want to donate! We can also get you a tax letter if needed. Good luck with the next few weeks! You got this. Aah! Our 2.5 yr old is totally trying to potty train himself too (I.e. Taking off diaper and going potty everywhere BUT the potty...)! Fun stuff! Also, where did you get those red pumps?! Super cute! Loving the new IG account! And tell Julia she is quite stylin'! 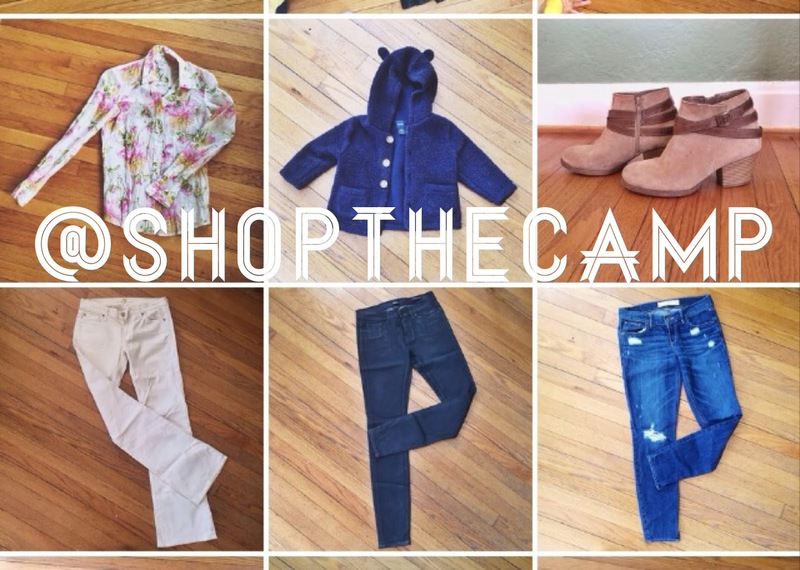 Not gonna lie, I am super psyched to shop the Camp! You have a great, accessible style that makes sure the average on looker has no idea the amount of bodily fluids you've touched that day. And that is impressive. We just got orders to VA (military is nice in that way, no interviews, they just say "go" and off you go) so the closet culling has begun for us as well. Which I will un-do with your Gram shop.